Toronto Chinatown. 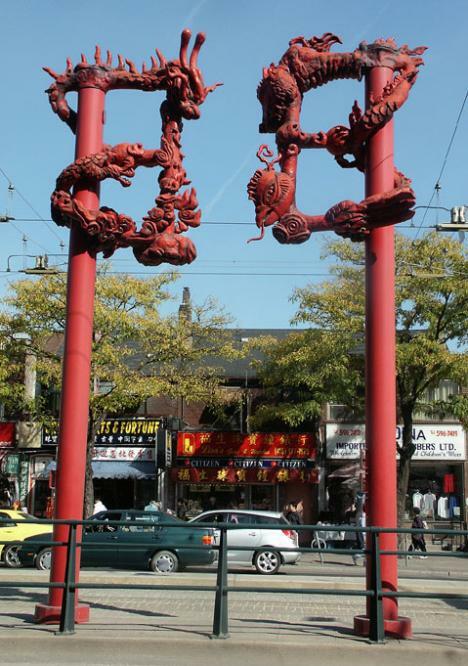 These dragons are located on the intersection of Dundas and Spadina Ave. - the heart of Chinatown. Toronto Chinatown is the second largest Chinatown in North America. This area is home to ethnic Chinese from Hong Kong, Singapore, Taiwan, Vietnam, etc. There is a vast selection of Chinese restaurants and shops offering Chinese delicacies. There are two large shopping malls, both near Dundas and Spadina streets – the Chinatown Centre and the Dragon City complex.